by Shane Henson — April 24, 2013—The Perot Museum of Nature and Science recently received a “4 Green Globes” rating out of a possible four from the Green Building Initiative for its sustainability practices. The museum, designed as a teaching tool that provides “living” examples of engineering, sustainability and technology at work, opened its doors to the public on December 1, 2012. 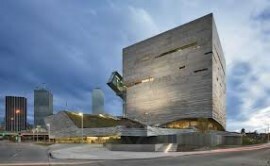 Located in Dallas, Texas, the six-story, 180,000-square-foot museum was created to expose children to a world of ideas and concepts in science, math and technology, all within one spectacular location. It was also conceptualized and built with sustainability in mind—as evidenced by the fact that only 12 out of 759 Green Globes-certified buildings in the United States have achieved 4 Globes, says the Green Building Initiative. The Perot Museum achieved an overall rating of 85 percent on the Green Globes rating scale and a score of 100 percent for the site design and enhancement measures to minimize the building’s impact on the site. It also achieved a perfect score for its integrated design process, integration of environmental purchasing, commissioning plan and emergency response plan. A nationally recognized green building guidance and assessment program, Green Globes helps commercial building owners advance environmental performance and sustainability through a rigorous online assessment that is followed by a comprehensive site visit and evaluation by an independent third-party assessor.